Even Greenpeace has underestimated the growth of renewables. In particular, solar has been growing exponentially, and may continue to be so for a while, though likely at a slower percentage rate. Greenpeace did much better than many at projecting the growth of renewable energy sources in the 2000s. Their projections were very close to outturn for wind – the 1999 projections were a little below outturn, the 2002 projections a little above. However even Greenpeace underestimated the growth of solar. The projections were nevertheless startlingly better than those of the IEA, who have, as I’ve previously noted, consistently underestimated the growth of renewables by a huge margin. Growth of solar has been exponential, as has that of wind (at least until recently). Greenpeace appears to have done well by following the logic of exponential growth. Exponential growth is so powerful that it can confound intuition about how large numbers can become. The counterintuitive power of exponential growth is illustrated by the process of making a traditional Japanese steel sword. The supreme combination of strength and flexibility of such a weapon is said to derive from the way an exponential process layers the metal. As the metal is beaten out and folded repeatedly to forge the sword the number of layers in the metal doubles up each time. Following this simple process 15 times creates 215 layers, well over 30,000. This would be impossible in any other way with traditional methods, and the number of layers created would be hard to comprehend without doing the formal calculation. This property of producing very large numbers from simple repeated doublings may have contributed to previous projections for renewables seeming implausible, because they were so much greater than the then installed base. This may have contributed to even Greenpeace being a little cautious in its projections for solar. Nevertheless exponential growth inevitably runs into limits as some stage. This is captured by the classic fable of grains of rice on a chessboard, where one grain is put on the first square, two on the second, four on the third, eight on the fourth and so on, doubling with each square. Half way through the chessboard the pile of grains, though very large, is manageable – around 50 tonnes for the 32nd square. However amounts then quickly begin to go beyond all reasonable physical constraints. The pile on the final square would contain 263 grains of rice, which is about 230 billion tonnes. This is about 300 times annual global production, and enough to cover not just a square of the chessboard but the entire land surface of the earth (to a depth of about a millimetre or two). Extrapolating growth rates for solar PV from the period 2000 to 2013, when cumulative installed capacity doubled every two years, runs into similar limits. At this growth rate the entire surface of the earth would be covered with solar panels before 2050. This would provide far more energy than human civilisation would need, if there were room for any people, which there would not be because of all the solar panels. So are there constraints that imply that renewables are now in second half of the chessboard – or, if you prefer a more conventional model, the linear part of an s-curve for technology adoption? Looking at solar in particular, as I’ve previously commented, it needs a lot of land, but this is unlikely to be a fundamental constraint. Some have previously suggested a limit as technologies reach scale, defined as about 1% of world energy supply, after which growth becomes more linear. However solar manufacture and installation are highly scalable, so there are fewer obstacles to rapid growth than with traditional energy technologies. Costs are rapidly falling, so that solar is becoming competitive without subsidy, both compared to other low carbon technologies and, increasingly, with high carbon technologies, especially if the cost of emissions is taken into account. There is no obvious limit to how low the costs of solar cells can go that is likely to bind in the foreseeable future, although the ancillaries may show slower cost falls. The costs of lithium ion batteries are also falling rapidly, having approximately halved in the last five years and continuing to fall at a similar rate. As a result daily storage is becoming much more economic, reducing the problem of the peakiness of solar output and easing its integration into the grid, although seasonal storage remains a daunting challenge. Solar still accounts for only around 1% of world electricity generation so globally there are plenty of opportunities globally in new electricity demand and from scheduled retirement of existing generating plant. The vexed issues around grid charges, electricity market structures and role of incumbents may slow growth for a while, at least in some jurisdictions, but seem unlikely to form a fundamental barrier globally as long as costs continue to fall. In short there seem few barriers to solar continuing to grow exponentially for a while, although likely at a slower percentage rate than in the past – each doubling is likely to take longer than two years given the current scale of the industry. Solar can still continue moving quite a long way up the chessboard before it hits its limits. How large the industry will become will need to await a future post, but provisionally there does not seem any reason why solar PV should not become a 300-600 GW p.a. or more industry. Policy has played an important role in the development of solar to date mainly by providing financial incentives. It will continue to play an important role, but this will be increasingly around removing barriers rather than providing a financial stimulus. Of course I cannot know if this fairly optimistic view is right. But it does at least to avoid some issues that might bias projections downwards. First, it recognises the potential validity of counter-intuitive results. In a sector such as energy which usually changes quite slowly the numbers resulting from exponential growth can seem implausible. This can lead to rejection of perfectly sound forecasts, as the intuition of experienced professionals, which is based on long experience of incremental change, works against them. Second it avoids assuming that all energy technologies have similar characteristics. Finally, it takes into account a wide range of possibilities and views and considers the drivers towards them, helping to avoid the cognitive glitch of overconfidence in narrow limits to future outcomes. The rate of growth of renewables is intrinsically uncertain. But the biases in forecasts are often more towards underestimation than overestimation. If you’ve been in the energy industries a while it’s quite likely that your intuition is working against you in some ways. Don’t be afraid to make a projection that doesn’t feel quite right if that’s where the logic takes you. In the calculations of the results from exponential growth I have, for simplicity, assumed very rough and ready rounded values of 40,000 grains of rice = 1litre = 1 kg. I’ve assumed 10m2/kW (including ancillaries) for the area of solar panels. The land surface of the earth is 1.5 x108 km2. Solar capacity doubled around every 2 years from 2000 to 2013, growing from 1.25GW in 2000 to 140 GW in 2013 (source: BP statistical review), reaching a land area of around 1400km2. 217 times its current area takes it past the land surface of the earth, so it would take to 2047 (34 years from 2013) with doubling of installed capacity every 2 years to reach this point. The source of the story about sword-making is from the 1970s TV documentary The Ascent of Man and accompanying book. This entry was posted in Climate change policy, power generation, renewables and tagged energy technology, power generation, renewables on 25/11/2014 by adamwhitmore. 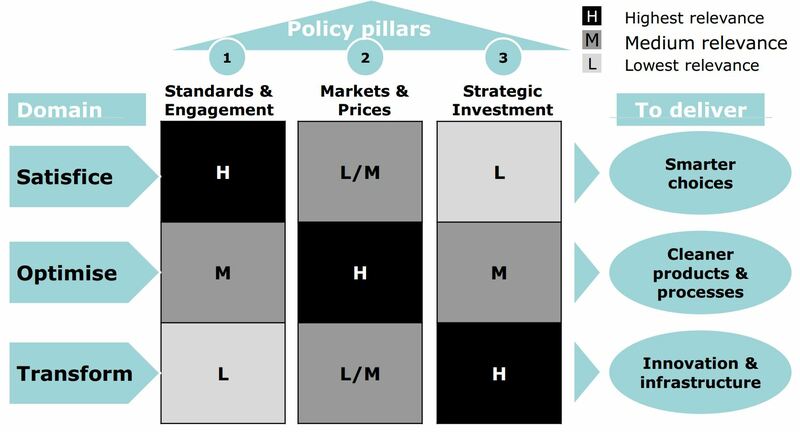 A new framework acts as a sound guide for policy formation. This entry was posted in carbon pricing, Climate change policy, emissions trading, energy efficiency and tagged carbon pricing, climate change, climate change policy, decarbonisation, emissions trading, energy efficiency, energy technology, social cost of carbon on 31/10/2014 by adamwhitmore. The IEA has greatly underestimated the growth of renewables for some years now. This illustrates how important it is to allow for unexpected outcomes if policy design is to be robust, as even well informed projections can be very different from the subsequent out-turn. The International Energy Agency’s (IEA’s) annual World Energy Outlook (WEO) is a thorough and well researched analysis of the outlook for the world’s energy systems. Over the years it has become the standard view of the world’s energy use now and in the coming decades. However it has had an extraordinarily poor track record in projecting the growth of solar and wind power in recent years. The charts below compare the IEA’s projections over the last few years with the out-turn for both wind and solar. Projections have been revised upwards each year. But they have still been consistently too low, by a very large amount in most instances, with the pattern persisting over many years for two different groups of technologies, wind and solar PV. As recently as 2006 it was expected to take until the 2020s to reach current levels of wind capacity, and until the 2030s to reach current levels of solar capacity, with current solar PV capacity almost an order of magnitude greater than expected in just seven years ago. The IEA’s projections have consistently increased over the years, but still fallen short of actual deployment …. It would, of course, be wrong to suggest that because past projections have been underestimates the current projections will also be too low. However the most recent projections continue to show rates of deployment that appear very cautious. The graphs below show the IEA’s projected rate of installation in the most recent WEO (for 2012) under its central New Policies scenario compared with past and current growth rates. For both wind and solar projected installation rates start below 2012 levels and remain roughly constant or fall over time. Decreases in installation rates are of course possible. Wind installation seems likely to be lower this year than last, although the rate of solar deployment continues to grow. However, projecting flat or slowly declining installation rates over the next couple of decades suggests either that current rates are a spike, or that installation is moving towards saturation. Neither of these possibilities seems likely. Costs are continuing to fall, especially for solar, renewables still account for a very small share of total generation, and drivers towards deployment of low carbon technologies seem likely to strengthen rather than weaken over the period. One does not need to be an advocate of renewables to expect that these industries are more likely to grow than shrink over the next couple of decades, even if growth of annual deployment may be much slower than in the past. It would seem more plausible if a central case scenario were projecting some continuing growth in annual installation, with decreases very much a low case. It will be interesting to see how these projections are adjusted in the next edition of the WEO due out in a few weeks. So what has led to this persistent underestimation of growth? There may have been a reliance on individual jurisdictions’ plans, with more caution than seems with hindsight to have been warranted about the rate at which policy might move. This seems to have led to linear extrapolation of capacities when technologies were in a phase of exponential growth. Projections for wind have improved in recently years as growth appears to have become more linear (at least temporarily), and following a large upward revision in the projected rate of addition between the 2009 and 2010 editions of the WEO. It may also be that there is some inherent caution about new technologies. However the IEA – along with many others – has tended, if anything, to be somewhat optimistic about CCS, so this cannot be a complete explanation. There are also specific circumstances that have played a role, notably being somewhat slow to recognise the falling costs of solar PV, with even the costs from the 2012 edition being well above actual values. There may also be a deeper explanation rooted in institutional conservatism. Taking a conservative view of future prospects in the energy sector can be necessary to avoid being swayed by the latest fad. A conservative view recognises the realities of the long time horizons and vast scale of the world’s energy systems. However it can carry the risk of missing the role of genuinely transformative technologies, as appears to be the case here. The IEA’s current caution may still prove justified. But Eurelectric, the European power industry association, noted in a recent report that the European power sector is already undergoing one of the largest transformations in its history. Such changes seem likely to be a global phenomenon. Wind and (especially) solar PV seem likely to form part of the largest transformation of the energy sector at least since the growth of oil consumption in the middle decades of the 20th century, and perhaps since the invention of the steam engine. The IEA seems to be slow to recognise this. Whichever way the future turns out, the IEA’s past projections show how different actual out-turns can be from even well-informed projections. This provides and important reminder that none of us can be sure about future changes to the energy sector, and policy design must always be robust against things turning out to be different from expectations. See http://www.worldenergyoutlook.org/ Data used here is from New Policies scenarios and Reference case for earlier projections. This entry was posted in power generation, renewables and tagged decarbonisation, energy technology, power generation, renewables on 08/10/2013 by adamwhitmore. Solar deployment – are there limits as costs come down? A kWh is a different product depending on when and where it is delivered. The rapid fall in the costs of solar PV implies that building grids, storage and commercial arrangements able to match supply and demand is much more urgent. This will require strong policy drivers. Falling costs are making solar PV increasingly competitive with other forms of electricity generation. This post looks at what might limit solar PV’s deployment if costs continue to fall and reach levels low enough to allow for additional expenditure on grids, storage and demand-side infrastructure while remaining economically competitive. I’m not taking a view on if or when this will happen, or how low costs might become – there is still a significant way to go to reach that point on a global basis. I’m simply looking at what the remaining barriers would be if they did. I’ll use some rough and ready numbers to look at what it might take for solar to produce around a third of the world’s electricity consumption. I’ll assume this illustratively to be about 17,000TWh (out of a total of around 50,000TWh) by mid-century, which would be around 180 times the 2012 total of around 93TWh of solar PV output. As has often been noted, the solar resource is easily large enough to provide such large amounts of electricity. Recent data from the US National Renewable Energy Laboratories (NREL) shows average US output of 70kWh/m2 based on total site area (i.e. not only the panels). Generating 17,000TWh on this basis (likely a conservative assumption, as panel efficiency is likely to increase over time) would require an area of around 240,000km2, less than 0.2% of the world’s land surface. This is a huge area – about the size of the United Kingdom – but far less than the land devoted to agriculture, which uses solar energy to grow food. And solar power can often make use of spaces – such as rooftops and deserts – that have few alternative uses. Local planning and environmental concerns seem likely to become a more prominent issue as solar deployment grows. However these concerns seem unlikely to place a fundamental limit on the industry globally. A solar industry meeting a third of world electricity demand would be very large, but not infeasibly so. It would require about 300GW of capacity to be added each year on average worldwide, around 10 times the 2012 installation rate, which has grown to its current level in just a few years. 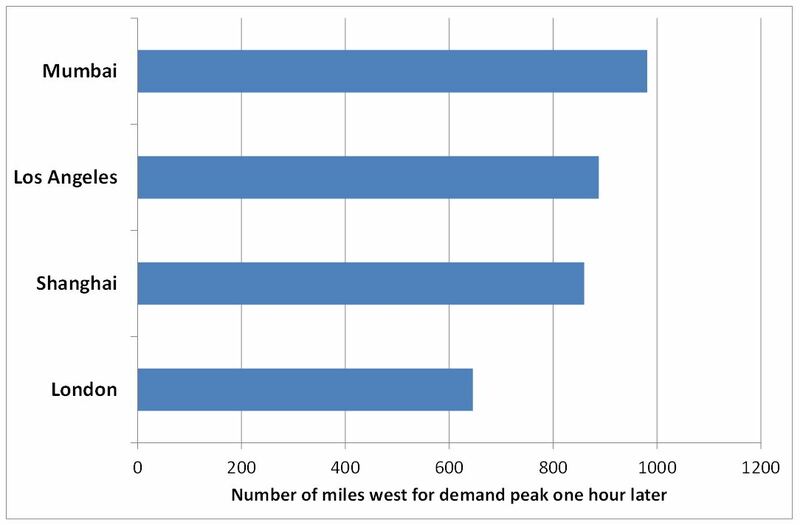 However, matching the location and timing of supply to demand is a huge challenge. Electricity at a different time and place is a different product and so part of a separate market. Grids and storage help link these different markets and so minimise load shedding (though some may still be required). The first problem is geographical proximity. In some cases (such as California and Mexico) demand is quite close to high quality solar resources. However in densely populated countries with weak solar resources, such as the UK, the challenge is much greater. Electricity may need to be brought from sunnier regions, especially in winter, requiring large scale transmission infrastructure. There may be more local issues. For example in Japan, grid reinforcement will be needed to bring power from the north to more populous areas, crossing boundaries between regional utilities. However problems in this respect may not be universal. One recent study indicated that the German grid is already quite robust. Matching the timing of output and demand is even more problematic. Solar output is much peakier than system demand, and peak output and demand will often not coincide. One indication is that load balancing becomes a significant problem when solar begins to account for more than around 10-15% of generation. As solar penetration increases relative prices at different times of day are likely to shift, which may well cause demand to respond. More sophisticated market arrangements and system operation are likely to become important features of most scenarios with extensive penetration of renewables. Matching the timing of peaks by moving power from where the sun is shining to where the demand is located could imply tens or hundreds of GW of power to be moved across continental distances. This is because the point at which the sun is highest in the sky (around noon), when solar output tends to be at its maximum, moves quite quickly across the surface of the earth. At the equator it travels at just over 1000miles/hour, implying that to service demand even an hour later in the day power must be moved hundreds of miles from west to east. The chart below shows how far west you need to go to shift the time of peak one hour later at the latitudes of some of the world’s major cities. To move the peak a quarter of the day – from a noon production peak to 6pm demand – you need to move power a quarter of the way round the world. And the direction does not always help. To meet later demand on the US west coast solar panels would need to be out in the Pacific Ocean rather than Arizona and Texas. ( Putting more west facing panels in California itself helps this. There is some loss of total output but the match to system peak improves). China, with its population concentrated on the east coast, is better served in the evening, but would run into problems in the morning. This implies that load balancing using transmission will be a huge challenge from a technological, regulatory and commercial perspective. Even the most extensive links may not be enough on occasions when the sun is over the oceans. The map below shows where the sun is shining at midnight GMT on 21st December. There is an hour or so of setting winter sun still left on the US west coast, and the weak first hour or two of the day’s output from panels in east Asia, with Australia in daylight (and therefore with some intriguing export possibilities if links can be built far enough). 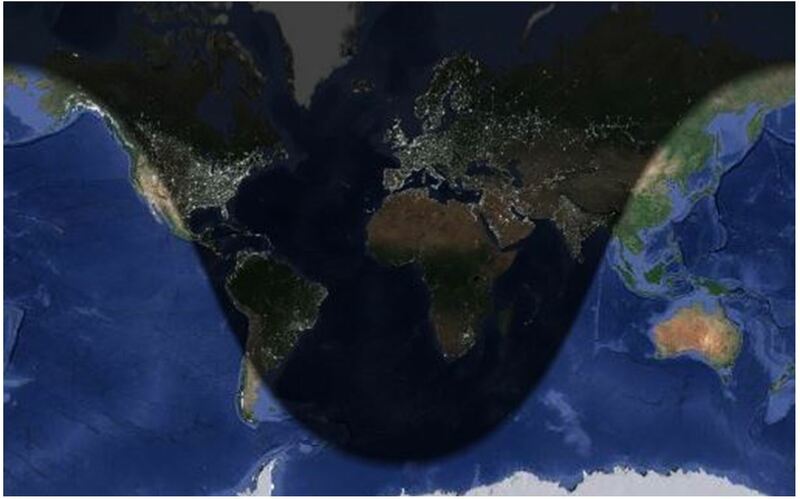 But the whole of Europe, Africa, the Middle East, India, and almost all of Russia and North and South America and a good deal of the rest of Asia are in darkness. Building storage to address this problem is challenging because of the huge scale needed, as well as because of the cost. The subject is too large to go into here in detail, although one recent study showed it to be crucial for reaching a third of supply in North America . In northern Europe very large amounts of storage are required even to balance load within the day. Seasonal storage (because for example average intensity of sunlight in the UK is nine times higher in summer than in winter) would require enormous capacity. Germany’s subsidy for storage as part of new residential PV systems, which was introduced in May, and California’s plan for 1300MW of storage by 2020 are early examples of the type of initiative that is likely to be required. Among other effects the premium for hydro power for load balancing is likely to increase. And reductions in load factor due to no storage being available and so surplus remaining unused at peak will be less of a problem the lower the capital costs of solar become. Building transmission and storage infrastructure, along with the arrangements to manage them, will take decades at the scale required. And getting the costs of storage down will also be hugely challenging. This will be accompanied by the need to make significant changes to market mechanisms so that they can more effectively balance supply and demand. None of this will be achieved easily, and strong policy drivers are likely to be required for this to happen as fast as now looks likely to be required if solar is to play a central role in decarbonising power systems. Few expected solar to become quite so cost competitive quite so quickly. This largely unanticipated increase in competitiveness leads to a similarly accelerated programme now being required to build grids and storage able to incorporate increasingly large amounts of solar into the world’s power systems. http://www.nrel.gov/docs/fy13osti/56290.pdf. I’ve taken the average for large solar of 3.4 acres per GWh. Consumers cannot readily substitute between consumption in different places and at different times – you need electricity in your living room now, and electricity in someone else’s living room later is not the same product. A hypothetical monopolist could profitably impose a small but significant non-transitory increase in price, implying that the markets are separate. David MacKay. Solar energy in the context of energy use, energy transportation ans energy storage. Philosophical Transactions of the Royal Society Vol 371,number 1996. See reference 3 above for a discussion of this point. This entry was posted in Climate change policy, power generation, renewables and tagged energy technology, power generation, renewables on 25/09/2013 by adamwhitmore. An s-curve model for the deployment of new energy technologies was published four years ago implies that it will be necessary to increase the rate of deployment of technologies already at scale alongside improvements in energy efficiency. An s-curve model for deployment of new energy technologies, which based its parameters on analysis of past rates of technology deployment, was published over five years ago [i]. It showed that new technologies typically start with a period of exponential growth, increasing by about an order of magnitude per decade. When technologies reach around 1% of world energy supply their growth becomes more slower in percentage terms (though not necessarily linear). The post exponential rate of growth and the saturation point for each technology on its s-curve are less clearly defined. 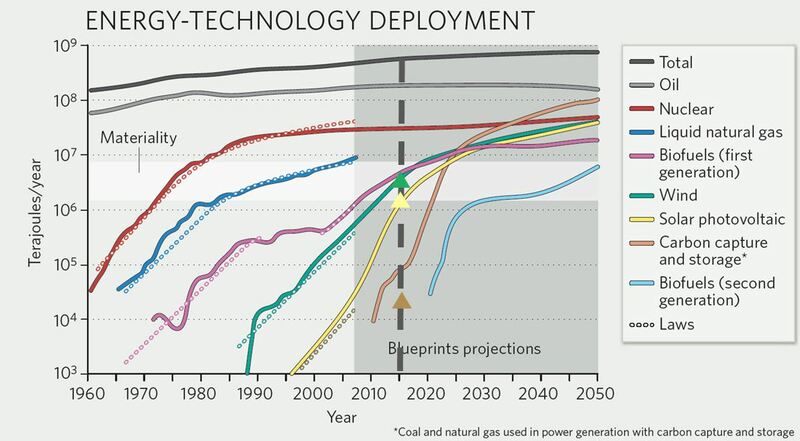 A wide variety of energy technologies conform well to this model (see chart), because it takes a few decades to build the scale of industry necessary to provide 1% of the world’s energy, then long replacement cycles in the energy sector (typically 20-40 years) and competition with incumbent infrastructure limit the rate of further growth. The projections have held up well for solar and wind, with the triangles on the chart showing the actual likely to be produced in 2015. CCS has been much slower to develop, and is likely to fall further behind projections for 2025 given the current rate of project development. This emphasises the importance of deployment of those technologies that are already at scale (wind, solar and nuclear). Continuing improvements in energy efficiency (despite rebound effects) and the use of natural gas in power generation also have an important role to play in emissions reductions pathways. And of course the sooner the scale-up of early-stage technologies such CCS begins the earlier they will be able to make a very large contribution, so starting now remains very valuable. There are couple of important caveats to this analysis. While the authors refer to the patterns as “laws” they are observed regularities rather than absolute constraints. Some technologies have particular factors associated with their deployment not captured by the model. For example, the reduced rate of growth of nuclear from the mid-1980s was driven by a particular confluence of political and economic factors, and its future growth is similarly subject to political and economic constraints in many places, although it is favoured in others. Solar PV has been growing much more rapidly than the model suggests, with quite different supply side characteristics to other energy technologies, being much more scalable. Energy efficiency technologies also have different characteristics, as the authors of the modelling work acknowledge. Other demand side technologies such as electric vehicles seem also seem likely to be able to scale up somewhat more rapidly than these projections suggest. And while some storage technologies might take time to reach scale lithium ion batteries seem likely to be able to grow very rapidly as there production is also scalable, although there may be some supply chain constraints that may partially limit this. These imply potentially different prospects for deployment in these cases. In view of the time required to build scale in new technologies, few energy policies seem more important than those that encourage continuing reductions in costs and increases in the rate of deployment of technologies already at scale, including wind and solar PV, along with continuing improvements in energy efficiency. This entry was posted in Climate change policy, power generation, renewables and tagged climate change policy, decarbonisation, energy technology, power generation, renwables on 24/05/2013 by adamwhitmore.